At their Nov. 14 meeting, Bradford County Commissioners (from left) Doug McLinko, Daryl Miller, and Mark Smith authorized the advertisement of the 2014 County Budgets for review. The public has 20 days to look at and comment on the proposals, which will be approved at the Dec. 19 meeting. The Bradford County Commissioners expressed general satisfaction with a proposed budget that will be available for the public to review as of Monday, Nov. 18. While slightly larger than last year’s budget at approximately $63.8 million, the commissioners agreed that each department within the county had done an excellent job at controlling spending. Changes made last year in the pay rate step grades and benefits for county employees helped to offset a cost of living increase of three percent built into this year’s budget. There have been no significant changes in the number of employees. “The budget is a moving target,” Commissioner Doug McLinko stated, noting that the board is continuing to look at the proposed budget and further reduce spending where possible. Grants that have been applied for or tentatively approved will cover the costs of some of the projects listed in the document, including the construction of a new taxi runway at the county airport and upgrade projects scheduled at the Bradford County Manor. County Human Resources Director Mark Agutter further explained that health care costs represent approximately $4,380,000 of the budget, with employees picking up approximately $711,000 of the total $5 million cost. Agutter offered the figures as a “snapshot,” noting that the number will fluctuate based on how many employees enroll in the plan. The county was initially faced with a 13.2 percent increase in health insurance. “We’ve had to dive into some alternative funding sources to bring that down 8.6 percent,” Agutter related. Most importantly, McLinko noted, there is no tax increase for county residents. As of Monday, the budget will be available for review in the commissioners’ office and online at www.bradfordcountypa.org for 20 days. In related county business, the commissioners approved an agreement with AFSCME and AFL-CIO District 87 regarding the salary contracts for the Bradford County Manor. McLinko applauded the negotiating team for bringing back to the table a plan on which both sides could agree. Agutter explained that The Manor is a county-owned facility, but runs separately from county government in most instances. Nonetheless, most of what happens there “filters back under the county’s umbrella,” which is why the county is involved in labor negotiations. Agutter was a member of the negotiating team, as was Manor Administrator Jim Shadduck. They worked closely with labor attorney Chris Gabriel who represented a labor firm in the Pittsburgh area. Together, they forged the tentative agreement that was signed by the commissioners on Thursday. Agutter expected the union leaders to sign off on the proposal this morning. The commissioners approved the reappointment of Alston Teeter to the Northern Tier Solid Waste Authority Board, citing the “fantastic job” he has done to date. The commissioners also modified their meeting schedule to accommodate the timing of the approval of the budget. 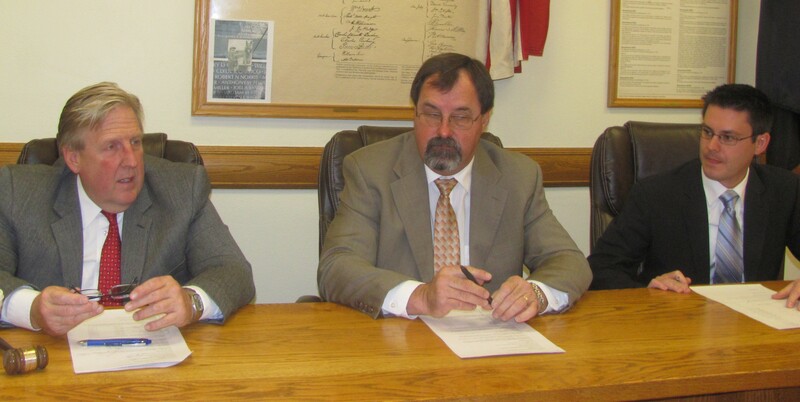 The final two meetings of 2013 will be held on Thursdays Dec. 5 and 19 at the courthouse in Towanda.